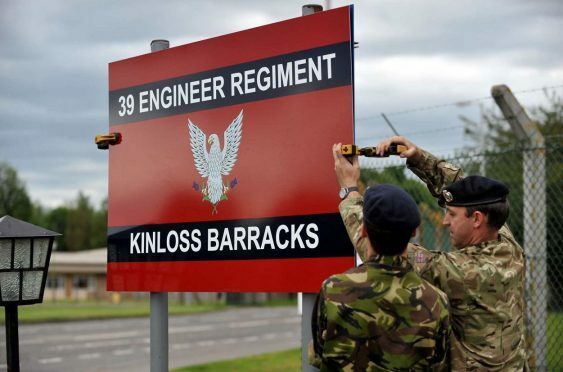 39 Engineer Regiment moved into Kinloss in 2012. Hundreds of extra troops are poised to move into Moray’s Army base. There were fears last year that Kinloss Barracks could be closed as part of a review of military spending across the UK. But the base was spared, and now a second battalion – comprising of up to 800 personnel – are expected to move in within “five years”. And there are hopes that Black Watch troops from Fort George – which was given a 15-year stay of execution in the review – could also eventually make the short trip along the coast. Last night, the Army said the finer details of troop deployments following base closures were still to be worked out. The news comes as Veterans Minister Keith Brown met Defence Minister Tobias Ellwood to press UK Government ministers to reconsider the decision to slash Scotland’s defence bases by 20%. The Ministry of Defence has already confirmed Kinloss is in line for further investments as part of a restructuring of the Army in Scotland. Following talks with military bosses, John Cowe, chairman of Moray Council’s economic development committee, said he was “hopeful” the barracks would be becoming busier. He said: “I don’t know the ins and outs of how it works but the space is there at Kinloss for extra troops. “I’m given to understand that they could be arriving within five years. “When the RAF had the base there was three times as many personnel there. It’s a huge site with a massive amount of scope for additional personnel. There are about 800 soldiers stationed at Kinloss Barracks as part of 39 Engineer Regiment. However, up to half of them can be out of the area at any one time on secondment. Moray MSP Richard Lochhead has long campaigned for the vast empty space at the Army camp, which was left when the RAF moved out, to be used so the site can reach its full potential. And he hopes a show of confidence in the base from the MoD will mean question marks over its future will never be raised again. Mr Lochhead said: “With Kinloss benefiting from an additional battalion then I would hope this would once and for all prevent the community having to go through any more reviews. “The former RAF base continues to have large areas that are under-utilised. Only this week I raised with the cabinet secretary for culture the potential to use the site for film and screen productions. “However, if the site is being considered for further defence roles, such as a new battalion or even by the RAF given the large runway, then clearly this has to be taken into account. Military activity in Moray is already ramping up with an extra 400 personnel due to move to RAF Lossiemouth with the arrival of Poseidon P-8 spy planes as part of a £400million investment in the base. It is now estimated that once their families are included it could result in up to 2,000 people moving to the region over the next three years.